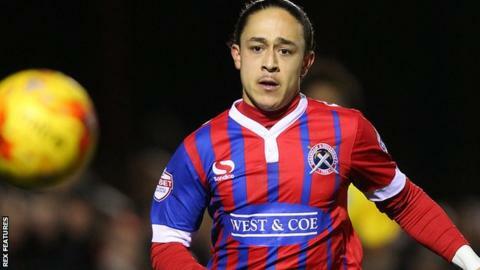 Coventry City have signed Dagenham & Redbridge winger Jodi Jones on a four-year deal for an undisclosed fee. Teenager Jones, 18, initially joined City on an emergency loan in March, making six first-team appearances. But, prior to that, he had already clocked up 40 appearances in all competitions in little over a year for the Daggers, scoring four goals. Dagenham & Redbridge Academy product Jones' new contract with City will officially start on 1 July. "It got a little bit tight at the end," City manager Tony Mowbray told BBC Coventry & Warwickshire. "After playing for us, a few clubs became even more alert than they already were and were potentially trying to hijack a deal, but Dagenham and Jodi and his family remained loyal to our agreements. "I like his directness and his positive play. We can develop him. He can become a goalscorer as well. He can dribble around the end of the box, get a yard and shoot with his left foot. We're excited about him. "I'm just trying to find some footballers that the club can invest in and give them two, three and four-year contracts, then you can have a continuity to the team." Technical Director Mark Venus added: "This is the most valuable transfer for the club for a number of years. We need deals like this to help progress to the next level. We've been able to beat a number of other clubs to his signature."